Guy Moreton’s work engages with the cultural histories and representation of landscape, particularly with its relationship to thought in literature, art and philosophy. For several years, Moreton has been drawn to landscapes that have had a major impact on male European émigré thinkers for whom exile, or displacement, has served as an intellectually creative condition, such as Austrian-British philosopher Ludwig Wittgenstein (1889-1951), the German writer W.G. Sebald (1944-2001), and the German artist Kurt Schwitters (1887-1948). 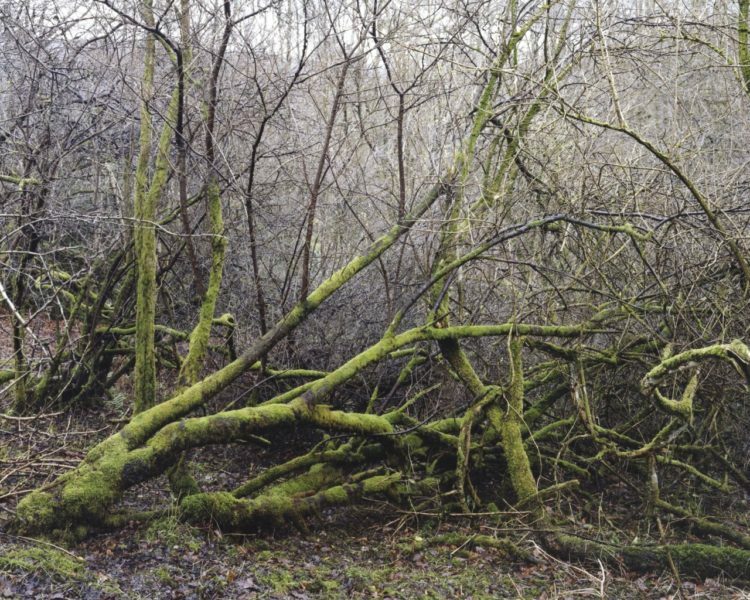 KS01, The Orchard, Langdale 2012 (2012) and KS02, The Wilderness, Langdale, 2012 (2012), the two large scale photographic works that have been acquired for Tullie House Museum and Art Gallery, explore the landscape which shaped German artist Kurt Schwitter’s final artistic practice in the Lake District. 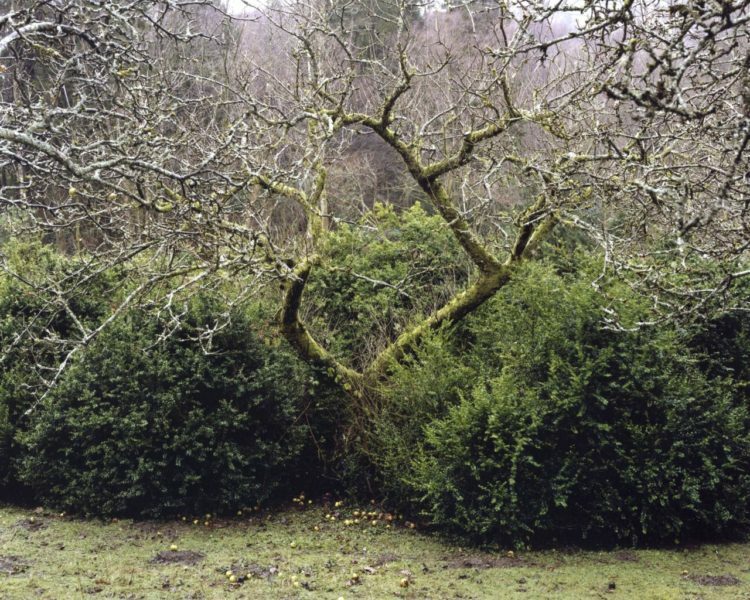 Moreton’s photographs depict a section of the overgrown apple orchard in winter at the Cylinders estate in Elterwater, where Schwitters spent the last years of his life working on his fourth and final ‘Merzbau’. A continuation of his original Hanover Merzbau, large architectural constructions that transformed the interiors of his parent’s house, the Elterwater Merz Barn (1947-48) comprises an abstract three-dimensional collage of found objects and organic debris from the area. Schwitters used the word ‘Merz’ to describe the process of combining fragments to make a new whole to signify the shattering of existence by war or other circumstances, as well as the artist’s ability to heal by combining these elements. Tullie House museum has developed a contemporary art collection relating to the landscape and natural world to build on the museum’s extensive collection of historic landscapes. Guy Moreton’s work enhances the museum’s focus of contemporary Cumbrian landscapes and fills an important gap by responding to Kurt Schwitter’s Elterwater Merz Barn and it’s relation to the landscape. Moreton’s photographs also contribute to the important story of the Lake District which has inspired art, literature and thought since the 18th century. Guy Moreton (b. 1971, Lincoln, UK) is an artist and Associate Professor and Course Leader of the MA Photography Programme at the Southampton School of Art and Design, Solent University. He studied Photography and Fine Art, and is co-author of Ludwig Wittgenstein – There Where You are Not (2005). His photographic work has been published and exhibited widely. Recent exhibitions include Humber Gallery, Hull (2017), Solent Showcase, Southampton (2016); The Bonington Gallery, Nottingham Trent University, Nottingham (2015); and The Hatton Gallery, Newcastle (2014).